Season 4 marked a strong comeback for Netflix Original’s House of Cards as its final episode placed President Frank Underwood (Kevin Spacey) in political and personal hot water and managing a domestic terrorism crisis, a tight campaign against political rival Governor Will Conway (Jeff Kinnaman), Tom Hammerschmidt’s (Boris McGiver) damaging story in the Washington Herald, and Vice President Claire Underwood’s (Robin Wright) torrid affair with writer Tom Yates (Paul Sparks). Season 5 picks up the story as Underwood aide-de-camp Doug Stamper (Michael Kelly) and the White House team start to deal with a long list of current crises. As the Presidential election looms large ahead, the 13 episodes promise to deliver some of the high-wire political intrigue that we have come to expect in this successful series. Speaking of the election, viewers will appreciate some not so subtle allusions to the real 2016 Presidential election with its continuing allegations of stolen votes and of interference by the Russian government. Campaign leader Leeann Harvey (Neve Campbell) and NSA computer expert Aidan Macallan (Damian Young) are planning some tricky (and illegal) behind-the-scenes moves to help the Underwoods. As a campaign gambit, Frank is trying to compel Congress to “declare war” against the jihadist terror organization, Islamic Caliphate Organization or ICO. President Underwood tries to curry favor with governors of key swing states as Press Secretary Seth Grayson (Derek Cecil) deflects some potentially damaging questions. With hot wife Hannah (Dominique McElligott) at his side, it looks like the stars are finally aligning for candidate Conway. Suddenly polling places are placed under federal guards as irregularities in two states challenge the eventual outcome and neither candidate gets enough Electoral College votes for an outright victory. It now appears that the House will determine the President and the Senate, the Vice-President. The Underwoods may be struggling, there is also trouble brewing in the Conway household. The House vote stalls and, according to protocol, Claire becomes President pro tem until a clear winner is declared. As is now customary for House of Cards, Claire immediately inherits a crisis involving a possible Russian incursion into an American station in Antarctica. 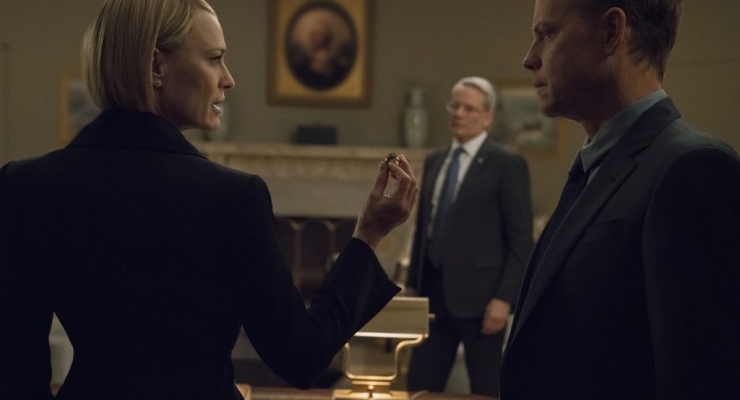 Macallan disappears only to turn up in Russian custody as Secretary of State Catherine Durant (Jayne Atkinson) meets with Russian President Viktor Petrov (Lars Mikkelsen) to address the Antarctic “crisis” that is eventually resolved in a roundabout way by the Chinese. After Conway and his campaign manager Mark Usher (Campbell Scott) fail to sway the Democratic Black Caucus, the Governor has a major meltdown in his private jet. Frank strikes a sub rosa deal with Usher that could reopen the voting in the two contested states. Claire’s meeting with duplicitous Deputy Secretary Jane Davis (Patricia Clarkson) is temporarily interrupted by an evacuation order occasioned by “fake news” that a truck containing nuclear material is reported missing in the D.C. area. The presidential race has boiled down to the Ohio vote. After the simultaneous release of secret recordings of Conway cursing out the pilots of his private jet and his irascible running mate, General Ted Brockhart (Colm Feore) making threatening remarks against President Underwood, their Ohio campaign tanks. Frank remains President and a post-election America becomes even more deeply divided. Much like the preceding installments of House of Cards, Season 5 shows an even stronger Claire, and provides the usual asides from an even more malevolent Frank (if that were possible). As the body count continues to rise, this dark Macbeth-like political saga moves inexorably forward and there seems to be no limit to how low human beings can sink under the weight of personal ambition. House of Cards remains a masterful display of en pointe scriptwriting, brilliant acting from the entire cast, and taut direction. After an epic final episode, there is already talk of a Season 6 in 2018. Season 5 of House of Cards is available for streaming in its entirety on Netflix. Another strong installment in this Netflix Original series of political intrigue and misdeeds at the highest level in the land.